I have been thinking long and hard about what I wanted to post for my 100th post here at 120 Square Feet. It has hard to believe I have been writing this thing for that long. I thought about posting something super insightful about living in a tiny space, but there really isn't much I could say. If you want to see posts like that, check out the things I have been writing about over at Tiny House Talk. Instead, I wanted to share this with you. My mom just reminded me of this. When I was a little kid, my dad use to read to me every night before bed. 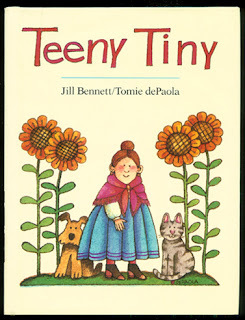 And one of my favorite stories was "The Teeny Tiny Woman". Now when the teeny-tiny woman got home to her teeny-tiny house, she was a teeny-tiny tired; so she went up her teeny-tiny stairs to her teeny-tiny bed, and put the teeny-tiny bone into a teeny-tiny cupboard. I have no idea why I was so fascinated by this story. Except that I was probably about three or four years old and the constant repeated use of "Teeny Tiny" gave me giggle fits. I mean, when you really pay attention to the story it seems a little horrifying to read to a child. But early in my subconscious I was fascinated by teeny tiny places. (But maybe not teeny tiny haunted bones). I am pretty sure we had this version of the story, but I could be wrong. In either case, the real lesson I've learned is now that I live in my teeny tiny house with my teeny tiny cat, I will be sure to stay away from grave yards. And who keeps bones in their bedroom cupboard anyway? My teeny tiny stairs, and my teeny tiny bed.